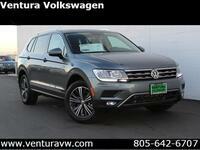 The new 2018 Volkswagen Tiguan offers drivers near Ventura, CA a versatile crossover SUV that is spacious, comfortable and high-tech. The popular SUV was named the 'Best Compact SUV for 2017' by Cars.com. The new Tiguan is available in front-wheel drive and all-wheel drive configurations, offers five- or seven-seat configurations and is optimized to give drivers and passengers more space. In addition, the new Tiguan offers drivers a number of Driver Assistance features that add both comfort and safety to driving. All models of the 2018 VW Tiguan include a four-wheel independent suspension, LED Daytime Running Lights, alloy wheels, Volkswagen Car-Net® App-Connect, Bluetooth® connectivity, a rearview camera system, Electronic Stability Control and so much more. Keep reading to learn more about the new 2018 Volkswagen Tiguan at Ventura Volkswagen! All models of the 2018 Volkswagen Tiguan are fitted with a 184-hp, 2.0-liter TSI® turbocharged engine with direct fuel injection and an eight-speed automatic transmission with Tiptronic® and Sport mode. The new Tiguan is offered in eight trim levels - S, S with 4MOTION®, SE, SE with 4MOTION®, SEL, SEL with 4MOTION®, SEL Premium and SEL Premium with 4MOTION® - each offering a unique set of standard and available features. The versatile 2018 Tiguan is configured with both five-seat and seven-seat models. Five-passenger Tiguan models feature 30 percent more cargo capacity than previous models (73.5 cubic feet). Models featuring 4MOTION® with Active Control all-wheel-drive system offers drivers an available third row, giving the new Tiguan the ability to safely seat seven passengers. Some of the best available features of the new Tiguan include an eight-inch touchscreen infotainment display, hands-free easy-open rear liftgate, LED lighting, Adaptive Cruise Control, Remote start, leather seating, Blind Spot Monitory, VW Digital Cockpit, Apple CarPlay™ and Android Auto™ compatibility, Fender® Premium Audio System and so much more. Schedule a test drive of the 2018 Volkswagen Tiguan at Ventura Volkswagen!